Cromarty Image Library - Alison Ligertwood on the steps of Miller House. Alison Ligertwood on the steps of Miller House. 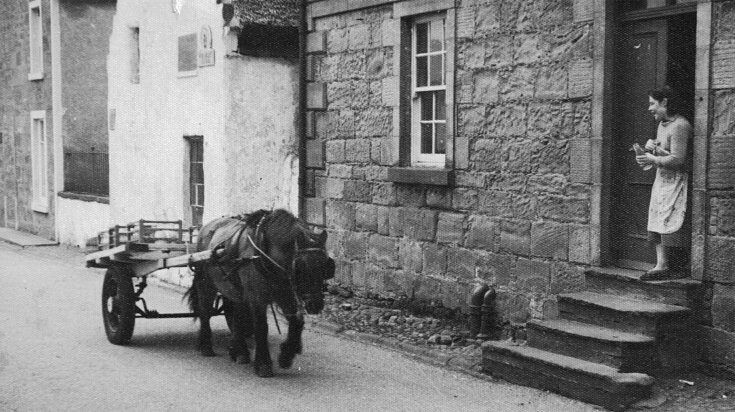 Patsy and the milk cart passing, with Hugh Miller's cottage and Paye house in the background. See also picture #3466. Aye I mind them all - when Jean the burns cat caught a bird she used to say "that's a tasty bite for puss" we'd be mortified at cat ripping poor wee birdie .and nellies dog was Flossie , she'd get a Milky Way from Tunnies shop for her.